Mark your calendar! Thursday & Friday, April 25-26th, Mary James Jewelry of Nashville, TN will be here for a trunk show of her beautiful work. 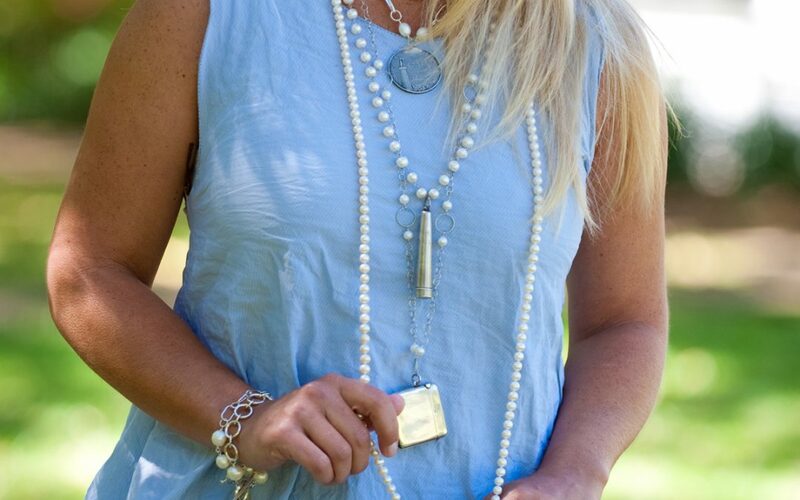 Perfect to layer or worn alone as a statement , Mary’s jewelry is timeless. Inspired by a love of everything Parisian, European architecture, and by her beloved father’s stories of travel while stationed in France during World War II, Mary created a unique line that resonates a classic, timeless yet fashion-forward style appealing to women of all ages. Mary uses precious stones like labradorite, pearls, chrysoprase, Peruvian opal, coral, turquoise, lapis and carnelian, all set in gold fill and sterling silver. Each antique is spun into a work of art that becomes an heirloom to be worn daily as well as passed down to generations. She recommends layering the pieces, and has clients wearing her designs with a casual white sundress, or with cocktail dresses and business attire. Perfect for Mother’s Day or gift giving in general- ~ even if it is a gift for yourself!